Thanks Tori for sharing your touching story. 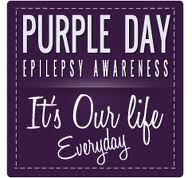 My grandfather had epilepsy; it’s a very scary disorder! I understand your frustration. My son has multiple severe food allergies and it’s an all-day, everyday, uphill battle. Other people really don’t “get it.” It’s just not something you think about until you have to deal with it yourself. I always hate people that view kids’ food allergies as inconveniences to themselves or their children. I always wonder if we asked the to make those same accommodations and the reason was my kid has cancer, would they react the same way? To me, epilepsy and food allergies are even scarier than cancer – you never know when a seizure or anaphylactic reaction might strike, and both can cause death if not immediately treated (especially with falls being a concern with epilepsy). I wish the best of luck to your daughter. Being a kid and battling health problems is never easy! And it’s never easy for their parents, either. My son had allergies when he was younger, thankfully he outgrew them. It was tough to find things that he could eat (he was allergic to milk, eggs and wheat). That was a few years ago, before there were really options! I think that people just don’t understand that somethings are more difficult then they seem. My daughter has Epilepsy and people always assume that she is Autistic, but she isn’t. It is frustrating that they don’t realize that other things can cause just as many problems.